Just say NO to baby TV! 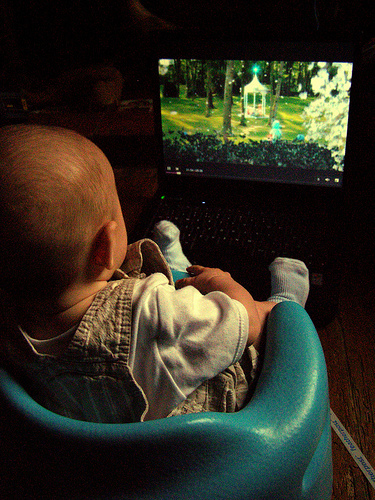 It’s not exactly a new discovery that early exposure to television causes a lag in infant language development, but a new study adds cognition to the equation. Not only did the authors of this new study include duration of media viewing, as is commonly been the focus of such studies, but they considered content in the research. This study is the first, to our knowledge, to have longitudinally assessed associations between media exposure in infancy and subsequent developmental outcomes in children from families with low socioeconomic status in the United States. Findings provide strong evidence in support of the American Academy of Pediatrics recommendations of no media exposure prior to age 2 years, although further research is needed. Interestingly, the authors found “No significant associations were seen with exposure to young child–oriented educational or noneducational content.” Three different types of content were studied, with only one showing negative associations. This content was designed for adults or older children; however, as I don’t have access to the full study, I can only assume it was non-violent or non-sexual in nature, otherwise ethical issues would be raised. Babies and toddlers should not be exposed to media. Television should only be watched for short duration by preschoolers. Only content specifically designed for the age of the child should be viewed. Given all of the research, I wonder if at some point overexposure to television, including duration and inappropriate content, could be used as evidence of parental negligence. Or could media companies targeting the youngest audience, such as BabyTV, be held accountable for knowingly harming the health of its targeted audience by its very existence and programming? Somehow, I am reminded of Big Tobacco. These studies always bother me because of this statement: “Television should only be watched for short duration by preschoolers” — what is considered short duration? Also, so many people with older kids have babies too. Though I never ‘sit’ my baby in front of the TV I also can’t continuously kick him out of the room when my toddler wants to watch a program. So, when they say that children before the age of 2 shouldn’t be exposed to media… what do they mean by ‘exposed’. Do they suggest to never ever have a TV open in a room where there is a baby?… really hard to do. From the data I can see, there is a fairly weak (if significant) association between media exposure and cognitive development. Correlation should not be taken as indicative of causality, meaning that other factors may be causing this association. For example, parents who as Karen suggests let the media babysit their kids may spend less time interacting with them themselves, which may slow down cognitive development. Thanks for highlighting this reseach & I like your blog!